How about letting loose yourself at the southernmost tip of India, where the blend of nature and religion leaves you awestruck? Yes, we are talking about your honeymoon in Kanyakumari that is likely to take you and your sweetheart on cloud nine. The trinity of the colossal Arabian Sea, Bay of Bengal and the Indian Ocean at the base adds an exclusive aspect to this destination. 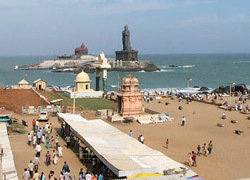 People refer Kanyakumari with the name of Cape Camorin as well and the primary attraction that Kanyakumari is renowned for is the Kanyakumari Temple, where the inhabiting deity is Kumari Amman. One finds beautifully constructed temples along with various other attractions as well as the dominance of art and culture on this beautiful land called Kanyakumari. And due to this reason, people love to bask in all that Kanyakumari honeymoon tours have in store for them. Therefore, you also must not waste time in pondering over on which place to go for your honeymoon. The best Kanyakumari honeymoon packages serve you with the best options. When it comes to going over to various attractions of Kanyakumari, couples can start their honeymoon in Kanyakumari by exploring the Padmanabhapuram Palace. The palace is more than enough to make you wonder struck as its interiors are made of granite and the exteriors showcase the predominantly Kerala design. Different museums and memorials also remain there to entice you through as visit Kanyakumari. You both can steer your way towards the Gandhi Memorial or the Vivekananda Rock Memorial or the Government Museum that awaits you on the Beach Road. Moreover, monuments such as Kamarajar Manimandapam or the Thiruvalluvar Statue, known for being the biggest in the entire India also deserve your visit during your Kanyakumari honeymoon tours. If basking in the charm of beaches and waterfalls is your cup of tea, then you both must make it a point to visit the spellbinding Sothavilai Beach or the Thengapattinam Beach or the Kanyakumari Beach that is also much frequented by those who are bent towards religion. Beaches like the Muttom Beach would amuse you through its captivating sunset and through various rocks dotted over it. The prominent waterfall such as the Tirparappu Waterfall and the Olakaruvi Waterfall are likely to cast magical spell on you both through its beautifully falling waters. In addition to the above mentioned places, there are places such as the holy temples that are numerous and that must not be missed out by culture and religion lovers. You can visit the Sri Sthanumalayan Temple that delineates striking architectural style. Other significant temples of Kanyakumari are Thirunanthikarai Cave Temple, Alvartirunagari Temple, Tiruchendur Temple, etc. and they are likely to make you al the more holy during your Kanyakumari tours. After this, you can think about what else deserves your visit in Kanyakumari. And with this on mind, you both can head towards the stunning forts that are a part of your Kanyakumari honeymoon packages. Yes, you both can visit the forts such as the Vattakottai Fort and the Udayagiri Fort that would enthrall you completely. in this way, you both can make the most of your honeymoon in Kanyakumari. Kids under age of 10 can be taken free of cost.